This is one of those films it’s difficult to review, as its impact is significantly based on plot twists which should not be discussed. Indeed, it’s probably better to know as little about this as possible, and just let it unfold. That’s the way we saw it, and it wouldn’t have been anywhere near as effective if we’d known the details in advance. This review will therefore be more of the “hinting vaguely” kind, rather than providing any detailed plot breakdown. I can discuss the basic premise, which is remarkably lean, to the point that the three actors listed above are the only three actors in the film, and virtually the entire thing unfolds in a single setting. Vic (Marsan) and Danny (Compston) were former prison cell-mates, now released. While in jail, Vic came up with a plan to kidnap someone for ransom. On re-uniting outside, Danny proposed a target, and Vic approves: Alice Creed (Arterton), whose father has the necessary resources to pay up. 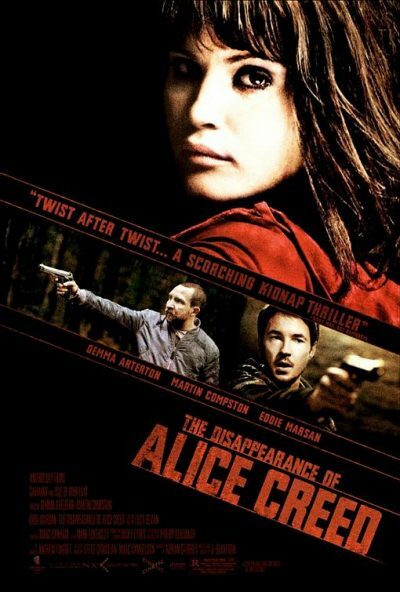 They put Vic’s meticulously-planned crime into motion, snatching Alice and taking her to the previously-prepared lair. The remainder of the film depicts the struggle for power and control between the three characters. You might think this would hamper Alice, who is tied hand and foot to the bed, gagged, and forced to communicate in hand signals simply to go to the toilet (though the toilet actually comes to her…). Not necessarily. And the final shot of the film suggests an alternative explanation for the film’s title, beyond the obvious. It’s watching this psychological fencing which is when the film is at its most enthralling, and you can forgive a static approach, which sometimes left me feeling as if I was watching a stage-play. This is cinema at its most basic level of storytelling – certainly not necessarily a bad thing – in that you keep watching, simply to see what happens next. While the performances are solid, it’s the script, also by Blakeson, which is a real joy. To give an example (minor spoilers), a gun is fired at one point, and disposing of the spent cartridge becomes a chore that threatens to undo the whole escapade. What you might forget, yet the writer doesn’t, is that the cartridge is only half the problem. I’m very keen to see what Blakeson’s clearly devious and twisted mind will come up with next.